For the month of January, I will post something new each day that you can do to stretch, strengthen, and mobilize your ankles & feet. Muscles in your legs that have attachments in the foot (extrinsic foot muscles) are targeted with the following exercises. They are meant to bring mobility to your ankles and strengthen and stretch the flexor and extensor muscles in your legs and feet. Moving your ankles through their full, natural range of motion keeps them supple and causes an increase in blood flow and waste removal to the lower reaches of your body, which means your heart won’t have to work so hard. Lie on your back with your hips flexed and the soles of your feet reaching towards the sky. Lower your knees to your chest and rest. 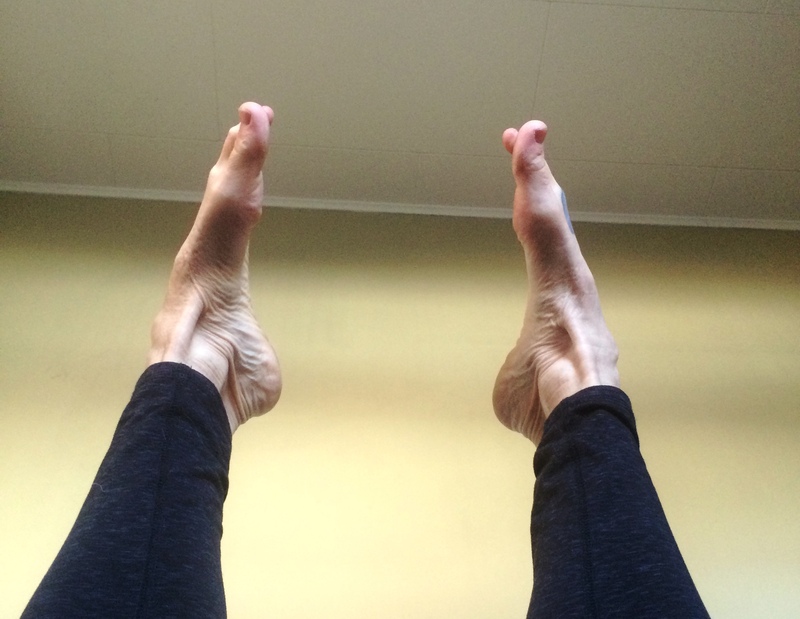 Turn the soles of your feet towards (invert) and away (evert) from one another 10 times. Foot eversion is less dramatic-appearing than inversion. Rotate both ankles, clockwise, in big, slow sweeping circles. Try to do 20 of them. Rest. Repeat, rotating both ankles counter clockwise 20 times. For more exercises that benefit your feet from world-renowned biomechanist Katy Bowman, try her DVD Fix Your Feet. You can find it in her Healthy Foot Kit. This entry was posted in Feet and tagged foot exercises, foot health. Bookmark the permalink.